Share this product and receive a $1.64 sharing discount. Who is your most foul and cruel enemy? 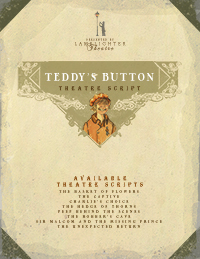 Flamboyant Teddy Platt cannot keep silent about the glorious history of his sacred button. Soon this passion brings him into contention with a new little girl in the village. God uses this enmity to bring Teddy to his knees, ready to sign up in the Lord's Army prepared for service in the war against his worst enemy - himself! Are you a faithful servant of the King flying the banner of Love over your life? Teddy has some lessons to teach us all. There is a $75.00 base royalty fee for this script. Additionally, there is a $7.00 licensing fee required for each actor. Orders for this product default to the $75.00 royalty fee and 1 actor fee for a minimum total of $82.00. Once the checkout process is complete you will receive a link to download the script. You will only receive one copy of this script in digital format, once you have filled out and returned the application form along with appropriate additional script fees, you may copy and distribute the script among the actors.